Margret Rey was born May 16, 1906. You may recognize her name as the co-author of the Curious George series of children's books, which she created with her husband Hans (H.A.) Rey. Margarete Elisabethe Waldstein was born in Hamburg, Germany. She studied art in college, and worked in advertising before meeting Hans Reyersbach. The couple moved to Paris in 1936. They were commissioned to write a children's book called Cecily G. and the Nine Monkeys. One of the characters in this book was a little monkey named Curious George. When the Nazis captured France, the Reys escaped on bicycle. The few possessions they took included a manuscript of Curious George. The Reys ended up in Spain before traveling to Rio de Janeiro and eventually settling in New York City. They were in New York when Curious George was published in 1941. The Reys were both great animal lovers. The had a series of Cocker Spaniels and also rescued injured animals and nursed them back to health. Their rescues included a little chipmunk who they fed with a dropper until he was well enough to eat on his own. They did not have children, but spread joy to children worldwide with their books. The Reys moved to Cambridge, and Marget continued working as a writer after Hans' death in 1977. She passed away in 1996 at the age of 90. 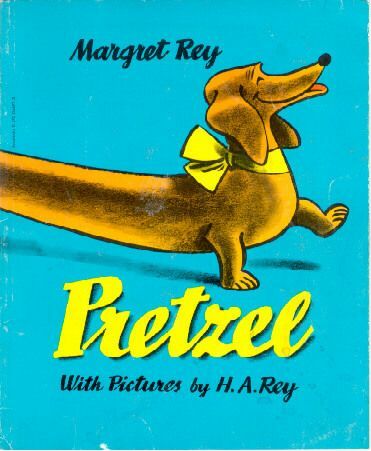 Fellow dachshund lovers will be interested in the book Pretzel, about a dachshund and her puppies. It was published in 1944, written by Margret Rey and illustrated by H.A. Rey. Did you grow up with the Curious George books - or even Pretzel? I would love to hear your memories in the comments, below. I didn't know any of this. Thanks! 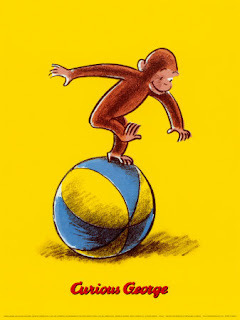 I grew up with Curious George! He's such a cutie! I'm still a kid at heart too, so when I babysit and the kid is watching Curious George (the show), it kind of makes me happy. Haha. I love finding out things like this. Curious George books are some of my favorites! It's really a fascinating story. I'm a children's librarian and happy to say that these books still get checked out all the time! Thanks for stopping by! Becky, that makes me happy to hear that these books are still popular with young children.